If you want to clear the clutter, increase light, or even boost space in a diminutive room, you may have to think about dressing up your windows. You may not need tons of ideas to maximize the potential of tiny rooms and an apt window dressing will have an enormous impression on the look of your room. There is a myriad ways to dress your window up; from using memorable curtains to traditional shutters. All of these cleverly combine style with practicality and creates an illusion that the space looks bigger than it really is. One of the neatest window treatment options for small interiors is plantation shutters. When these shutters are folded back, maximum sunlight is allowed to enter the small room. Plantation shutters offer maximum flexibility when they are split into a couple of tiers and also provide privacy and a stylish feel to the small room. Another window treatment option is pitched ceilings for attic rooms and often has small windows for maximum impact. A simple roller shade or Roman blind designed to fit snugly in the window should be perfect for a neat and orderly feel. A window treatment option that offers visual impact is fabrics with small-sized prints. They should complement the rest of the decorative scheme. An ingenious trick of adding a couple of cushions of the same fabric design will draw your eyes up towards the ceiling acting as a unifying element. A melodramatic testimonial for the tiny room; is to combine formal styling with bold colors. 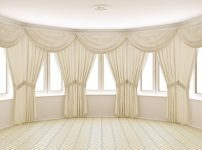 A pair of full length curtains, which has same shade as the walls, will draw your attention outside. It also creates the illusion of having a more spacious interior. Small kitchens benefit from all the storage space they can get. Any space available above a window for storage of pans and other utensils will do double duty. Better still, you may add a shelf across the window and store your glasses which will not hinder sunlight from streaming in. Consider choosing a contemporary styled window treatment for your modest-sized living space. These window treatment options can include design details such as faded flowers. What’s more, adding complementary cushions and even a tablecloth to the mix will create a unique mood for your space. Small rooms can benefit from layered window treatments that serve a dual purpose. On a practical note, combining full length curtains with wither blinds or shutters offers maximum flexibility where warmth and privacy are concerned. When these curtains are drawn, additional protection for insulation against the winter draughts becomes possible. Closing the shutters during summer not only provides privacy but keeps your room cool as well. 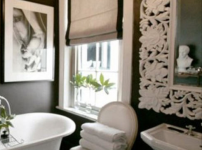 There are definitely more window treatment options for small spaces to choose from. It won’t be hard to find window treatment options that offer both luxury and sophistication on the market.